I could probably blog for a month straight about all the shopping I've been doing to fill up our new home. My husband and I calculated the cost of shipping furniture from Japan to the U.S. and realized that, in most cases, it made more sense to sell our furniture in Tokyo and buy new stuff here. So now I get to start all over with my decorating! One problem I'm having is trying to fill up our space with necessities like chairs that will work when we move into our permanent house in the coming months. Only I don't know what our permanent house looks like, as we haven't decided on one yet. After eating our dinners on the floor for a few days, I finally made a move in the chair department. I've been wanting steel chairs for a while now. I love the finish on the chair in the center, but went with the stacking set of 4 because the price was right. As soon as I can find the cord that hooks my camera to the computer, I'll upload some pictures of them around the $33 table I bought from a nice lady on Craigslist. The finish isn't exactly what I had in mind ... they look sort of spray-painted-silver. On the other hand, they're very sturdy. Now I just have to decide on a stain or paint color for the dining table and get to work! 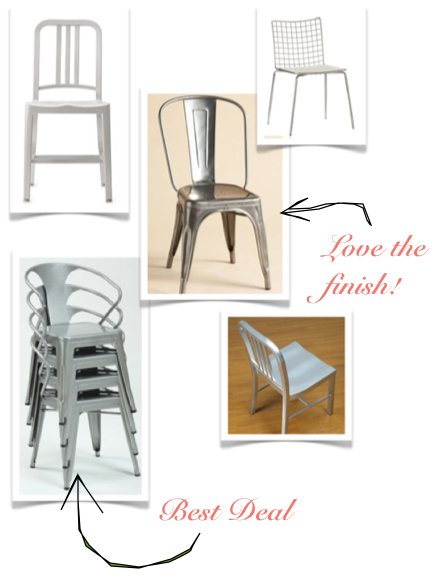 Chairs from top left: 1006 Navy Side Chair, Encore chair, Silverstone side chair, Silver Tabouret stacking chairs. Center: 1934 dining chair. I love the finish and the design of the steel dining chair in the middle. Why not stain the dining table? A lighter finish adds a rustic feel and a darker stain gives a contemporary look. We ended up finding a beautiful oak table at a yard sale and refinished it in a dark stain close to our floor color and another antique in the dining room. Still haven't done anything to the original table which will go in my office/craft room. The ones I bought "Best Deal" are very durable. Love them.